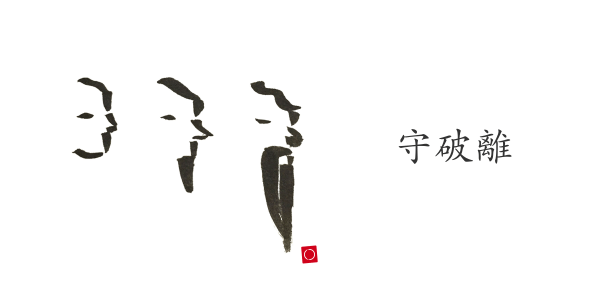 The author also follows up with this article, Shuhari is about master-apprentice, not solo learning. The two posts are useful together. I find that this mental model for phases of mastery can inform teachers and learning leaders. I wonder how it can be used in teacher preparation in order to focus discussion around mastery and other education goals. I also imagine Shuhari can help direct life-long learners in the use of mentors and reference materials and other resources. The Eastern Thought cred can be exploited since some tend to assume that Eastern philosophies are historically older and more mature than American philosophies and traditions. This Far Eastern-philism (love for things far eastern) has been noted and lampooned in viral posts on social networks. Articles like these help remind me not to use terms in public if I don’t know what them mean. It also reminds me of the time I used a slang term that did NOT mean what I thought it meant. (“Chicken-head,” for example, is not a term for a female gossiper. Trust me on this.) Trying to be “hip” and “with-it” usually doesn’t work out too well no matter how “cool” you think you are. I don’t know why Eastern thought is so powerful to me, but many Westerners, especially Americans in the United States, reveal interests in (Far) Eastern philosophies. This is a trend that extends decades back into American history, at least in popular fiction, probably due to American involvement in World Wars I and II. Numbers of creatives, for various reasons, have consumed traditional aspects of Chinese, Japanese, and Indian religion and philosophies in the form of martial arts, fashion, religious beliefs, cuisine, and approaches to life and aesthetics. Trying to think from another’s perspective generates many insights into our own beliefs and practices. The Other reveals our blindness and illuminates. Similar insights are achieved when traveling to foreign countries and in finding ways to engage with people living there. “The most common criticism of aikido is that it suffers from a lack of realism in training. The attacks initiated by uke (and which tori must defend against) have been criticized as being “weak,” “sloppy,” and “little more than caricatures of an attack.” Weak attacks from uke allow for a conditioned response from tori, and result in underdevelopment of the skills needed for the safe and effective practice of both partners. To counteract this, some styles allow students to become less compliant over time but, in keeping with the core philosophies, this is after having demonstrated proficiency in being able to protect themselves and their training partners. Shodokan Aikido addresses the issue by practising in a competitive format. Such adaptations are debated between styles, with some maintaining that there is no need to adjust their methods because either the criticisms are unjustified, or that they are not training for self-defense or combat effectiveness, but spiritual, fitness or other reasons. “Another criticism pertains to the shift toward ki as the focus of training. After the end of Ueshiba’s seclusion in Iwama from 1942 to the mid-1950s, he increasingly emphasized the spiritual and philosophical aspects of aikido. As a result, strikes to vital points by tori, entering (irimi) and initiation of techniques by tori, the distinction between omote (front side) and ura (back side) techniques, and the use of weapons, were all de-emphasized or eliminated from practice. Some Aikido practitioners feel that lack of training in these areas leads to an overall loss of effectiveness. In these reflections, it can be valuable to note the questions that emerge. Why does the authenticity of Eastern philosophy matter? Shouldn’t a resonating thought matter for its own sake? The answers to these questions depend on the learner’s goals. The answers also depend on the learner’s thinking skills. For me though, as I learn more about dignity and its history, and learn about the tripartite domains of mind, I have broadened my understanding of what “thought” can be. Do We Really Have High Expectations for All Students? Do We Really Have High Expectations for All Students?. via Do We Really Have High Expectations for All Students?. Modeling and embodying desired behaviors are each important, commonly called “walking the talk”, but even in the “walking”, you can’t forget to, at least occasionally, talk. Spreading the messages that you need to spread in order to lead is valuable. You also need to spread messages in order to influence the culture of your organization, building, or department or classroom. Communication is a significant piece of culture building. People need to get the message. Delivering the message isn’t like cooking meat in a crock-pot: you don’t say it once and expect it to be taken to heart. You don’t “set it and forget it. Instead, the message needs to be seasoned, massaged, tenderized, portioned. People might need to simmer in it. Even when you’ve put so much work into creating the message, you still need to serve it out. The message needs to get around. Everybody needs to be at the table, and everybody needs a serving. People need second and third helpings. They may even need it reheated a day or two later as leftovers, the way we Americans do with leftover turkey after Thanksgiving. We use the leftover turkey in hash, in sandwiches, maybe diced up and fried with rice, or we may boil it up with turkey bones and vegetables to make a soup. This is really stretched out metaphor to demonstrate that the message needs to be repeated often and everywhere, but this doesn’t mean that you should say the same thing repeatedly, word for word. You use the turkey, the message, in different ways. There is a difference. One key to understanding this point, beyond my clever metaphor, works for me and may work for the reader. It is this video clip from Star Trek: DS9. You can watch it here. Pay attention to what the alien is complaining about (if you can catch it at the very beginning) and see how the human responds. To stay focused on the message, I don’t think there is a need to go into the backstories of each of these characters. Much of what they communicate nonverbally tells you a lot about their attitudes, their differing sense of self, and their nonverbals even communicate how much respect each has for the other. This is important to remember about message, but it also highlights the need for emotional and social intelligence. Their words are my main focus though. I’ve included them below. Dr. Julian Bashir: It’s a children’s story, about a young shepherd boy who gets lonely while tending his flock. So he cries out to the villagers that a wolf is attacking the sheep. The people come running, but of course there’s no wolf. He claims that it’s run away and the villagers praise him for his vigilance. Elim Garak: Clever lad. Charming story. 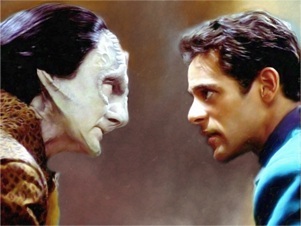 Dr. Julian Bashir: I’m not finished. The next day, the boy does it again, and the next too. And on the fourth day a wolf really comes. The boy cries out at the top of his lungs, but the villagers ignore him, and the boy, and his flock, are gobbled up. Elim Garak: Well, that’s a little graphic for children, wouldn’t you say? Dr. Julian Bashir: But the point is, if you lie all the time, nobody’s going to believe you, even when you’re telling the truth. Elim Garak: Are you sure that’s the point, Doctor? Dr. Julian Bashir: Of course. What else could it be? Elim Garak: That you should never tell the same lie twice. What you see (or read) is the story’s narrative. This is something that doesn’t have to change, but is often more powerful when embellished or told with one’s particular style to make it your own. Bashir, the human doctor character, tells this story with some level of drama and with a smidge of arrogance and attitude. He is, after all, lecturing Garak, the Cardassian alien, about telling lies. However, each character interprets the message differently. That’s the message many of us who have matured in Western civilization grew up learning. These are messages from fables that are commonly shared and discussed. They unite us as Westerners. Many of the tales of Aesop are used to caution us to regulate our impulses, and to especially avoid giving in to our vanities and from succumbing to the “seven deadly sins”. Proverbs, sayings, and deeply held myths of our cultural heroes does this as well. In the USA, for example, we have our tales that praise the honesty of Abraham Lincoln and George Washington, the industriousness of Benjamin Franklin, and many others. We are directed to value these tales as examples of character and valued behaviors. We refer to these narratives just as Bashir does, to illustrate a point, the message, but the heroes also provide a reciprocal support to the message. They offer the benefit of their halo effects: “The halo effect is a type of cognitive bias in which our overall impression of a person influences how we feel and think about his or her character. Essentially, your overall impression of a person (“He is nice!”) impacts your evaluations of that person’s specific traits (“He is also smart!”).” Famous people, known for genius and innovation, are often hijacked for the benefits of their halo effect on the message being used. This is one of the reasons many brands pay famous people great deals of money for the use of their faces, their voices, or their presence(s). It’s why, if a prospective visionary wants somebody to consider a particular quote as intelligent and profound, we might attribute it to Albert Einstein, even though he is mainly known for his being a genius of physics, not for being a thought leader or influencer. The person or organization using the famous person is banking on the popularity of their reputations to increase message impact, interest, and persuasiveness. Many experts agree that leadership is about communication. Leaders should find ways to communicate vision, missions, goals, and how employees can help their realization. Leaders say this is where we are going and this is how you can help us get there. There are many ways to deliver messages. Some of these messages are sent in only one direction however. This isn’t communication with interactivity, though. We are often taught that “real” communication fits a model where a message is sent, received, and feedback is returned. However, a low level of messaging has its place and its uses. When leaders tell their stories and present their visions and missions to a group, this will usually involve very little interaction, but can inspire and shift perspectives or offer hope when times are not so good. We call these communications speeches and presentations. Even orations. Some are so monumental and powerful that they are recorded for posterity. Many of us have our favorite speeches from history. On the other hand, sometimes we need to do some meet-and-greets, some community meeting, some townhalls, some Q and A time, in order to intensify the message and to fine tune the understanding of your message. Every individual person will have their own spin, their own take. We have singular identities and differing histories. We were trained and educated differently. We’ve had different experiences that have altered our world views. Look again at the lying boy narrative. You see that even the simplest tale can be interpreted differently. Leaders need to control interpretation. In fact, many times, you want to interpret the meaning of your narratives FOR your audience. You tell them what it means. When you tell people what a narrative means, you re-emphasize your vision, goals, particular goals or particular objective. This is how you repeat a message. To some, you share anecdotes and close with how it connects to the vision or its parts. To others, you award badges, certificates, bonuses for specific performance goals an employee has achieved that exemplifies the values and expectations pushing the organization closer to your vision. When employees act in ways that create obstacles to realizing The Vision, the disciplinary discussion still connects to the vision, but communicates how the employee is NOT doing his part. Orientation training introduces the values and mission. The organization’s origin story is a narrative that explicitly states some key messages. Company parties push the message with slogans on cups and napkins. Teams have mascots, fight songs, t-shirts….you get the picture. However, Disney is a company, and may be the “happiest place on Earth”, but even Disney has the occasional bandwagon heretic. That’s where the onboarding comes in. To bring employees onboard, there needs to be interactivity. In this economic environment, teachers are not the only knowledge workers inundated with new policies, procedures, approaches, and tools. The relentless drive for growth requires The New or pre-owned. Some call this progress and innovation, and may see this in a positive light. Others will have a less than favorable attitude and response. Staff opinion and attitude towards the changes will range across a spectrum. But even those who are the exceedingly enthusiastic early adopters may not get the same message you mean to give them. Even the enthusiastic may misunderstand intents and purposes and can lose that enthusiasm when they are set straight. Enthusiasm–even low level enthusiasm–is what you need if you want actions performed with fidelity. Enthusiasm, aka esprit de corps, may carry you through the training and mundane steps located on a checklist so that the many steps are carried out with fidelity. You must recognize this need for esprit de corps, because there are many opportunities in the knowledge work fields to do the minimal, giving the appearance that orders are being carried out, even while they are not addressing what is needed with fidelity. Quality and effectiveness usually depends on this fidelity. Disregard how colleagues and staff respond to your messages, disregard their commitment, at your peril! Blind Spots to Developing a School Culture of Leadership | The Leader In Me. via Blind Spots to Developing a School Culture of Leadership | The Leader In Me. Resumes and coverletters are modes of communication that are used to specifically communicate the list of beliefs about how the candidate could satisfy somebody else’s needs. This kind of communication should not have any information that would contradict this argument. But, as recruiters become increasingly sophisticated in their searches to fill positions, they need more information than what you were previously hired to do. They might want an idea as to how successful you were at performing those duties. That performance may need to be rated or compared to the performance of others. Developing students who can explore the needs of another requires the sophisticated development of a “theory of mind”, which may include the active development of empathy, making it more conscious than passive. What kind of design activity might facilitate the learning of task analysis and social-emotional needs of a person performing in a certain company, department, set of duties? Managers want to hire the best talent. So when your resume gives a rundown of your duties and responsibilities in each position, it offers the hiring manager little information as to how well you performed on the job and what you are capable of doing. Your resume really needs to highlight your accomplishments – it tells the hiring manager here’s what I can do for you and here’s proof that I‘ve done it before – and I’m great at it! Ask yourself some of these questions to help turn duties into accomplishments on the resume. 1. What would you brag about? Think of a particular instance where you utilized specific knowledge or skills important for the job you’re applying for and came to impressive results. 2. How do I compare with my peers? Are you more senior than others? Do you specialize in a particular area? Are you the ‘go-to’ person for specific areas? Were you chosen to train others? This will help differentiate you from others who may have the same level of responsibilities and duties. 3. Was there anything I did that was above and beyond my normal responsibilities? In some professions, it’s harder to quantify results, in which case we go to qualified results and look at how you may have improved a situation like employee retention, customer service, and so on. 4. Was there a time when I was recognized for a job well done by those higher up? Things like Employee of the Month, Top Salesperson of the Year, and other forms of recognition can be used to relay how great you are at the job. 5. Was there something I did or an idea I proposed that led to implementation that resulted in notable improvements in performance, service, or profit? This question can also be used to help you showcase results. It’s important to remember that hiring managers already understand the duties of the job – they want to know how you are better than the next job candidate, and that’s the difference between a resume that lists duties and one that demonstrates accomplishments on the job. Remember also that success and accomplishments are best demonstrated when performance is measured – whether quantified, qualified, or both. via How To Turn Duties Into Accomplishments On A Resume | CAREEREALISM.